which is independent of the initial spin rate. 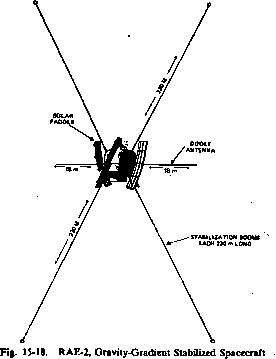 For example, for the HCMM spacecraft, with / = 18.4 kg m2, /f = 0.5 m and two yo-yo masses of 2 kg each, a cable length /=(4.6 + 0.25)'/2 = 2.2 m would completely despin the spacecraft for any initial spin rate. Momentum Transfer. Momentum transfer is an acquisition maneuver used for dual-spin spacecraft. 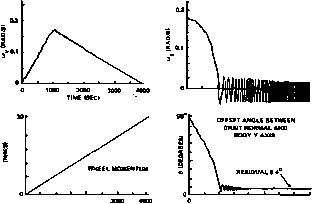 Initially, the body is spin stabilized at an angular velocity Q and the wheel is fixed in the body frame (Fig. 19-15a). Finally, the body is despun and most of the momentum is transferred to the wheel (Fig. 19-15b). For Earth-oriented missions, the desired final attitude is such that the wheel axis and orbit normal are col linear and the residual body spin rate, «„, is 1 revolution per orbit about the orbit normal. The maneuver for an Earth-oriented mission is illustrated in Fig. 19-15 and described by Barba and Aubrun  and Gebman and Mingori . Essentially, the maneuver involves a transfer from an initial configuration in which the body is spin stabilized with the attitude antiparallel to the orbit normal and the wheel is despun, to a final configuration in which the body is despun and the wheel is spinning with its axis antiparallel to the orbit normal. * Because the wheel axis (body/ axis) is normal to the initial spin axis (body z axis), the maneuver results in the erection of the wheel axis to the orbit normal. Although the total angular momentum vector is conserved during the maneuver and the magnitude of the wheel angular momentum may be controlled via the wheel speed, the partitioning of the total angular momentum vector between the body and the wheel cannot be fully controlled. Consequently, the total transfer of momentum to the wheel cannot, in general, be obtained and the final state will consist of the wheel axis nutating about the conserved total angular momentum vector. *As described in Section 18 J, we assume the body / axis is to be aligned with the pitch axis of the orbital coordinate svstem or the negative orbit normal.